North Coast Journal October 19, 2006 : ON THE COVER : Will vote for...? on the cover: Arcata Plaza's McKinley' statue. Photo by Bob Doran, montage by Holly Harvey. Last Friday sunshine beamed on the Arcata Plaza, warming the still-vibrant colors of the scenes local artists had chalked on the sidewalks at Pastels on the Plaza the previous weekend. Students, homeless people, raggedy travelers and workers on break wandered into the sunny square to sit on benches and on the edges of planters towering with sunflowers and hollyhocks. A pair of cops parked their patrol cars and ambled about, stopping briefly to chat with a trio of plaza loafers standing in one corner of the grass then moving on, smiling. Distressingly, a cloud gathered over the hill above town, where students, faculty and staff stood outside one of Humboldt State University's buttery-stucco new entrance gates to protest the administration's recent budget cuts and layoffs. Others, at a budget-cuts info booth on the quad (next to booths for the women's rugby team's "juicy Jell-o wrestling" sign-up, a sorority's speed-dating promotion and Arcata City Councilmember Dave Meserve's re-election campaign) urged students to sign contracts vowing to take enough credits to be full-time-equivalent students. At the Meserve station, an outburst: "Everything is local, when it comes down to it!" exclaimed an agitated man. Even so, there was mostly sunshine up there. It shone on student Joel Davis, sitting on the steps leading into the art department and running a highlighter over his notes. A lovely day. And Arcata, a lovely city. Davis, who is from Southern California, chose Arcata for its "open-mindedness, its artistic community" and its rural nature. "I just really like how the local politicians are trying to change things, and set an example," Davis said. Left: "Plazoids." Photo by Bob Doran. And down in City Hall, by God, they had indeed been taking on the world. No to Bush this, no to Bush that, and ban the big-box chain stores. Oh, so what if the national press kept profiling the city as a microscopic beacon of lunatic hope in the gathering mist -- someone, somewhere, was bolstered by the council's actions. And, whatever -- festivals, a place to loaf, flowers, a university, a little spice of sunshine now and then, dancing in the square: What's not to like? But let's face it: Every city fusses over those troubles. And this is election time. Eight people are vying for two spots on the Arcata City Council. And what, really, is there for the people of Arcata to rally around? Is there something big, something shattering, something paradigm-shifting (to use a favorite Arcatan term)? "I think the progressive bent will continue," said Humboldt State University Professor Bill Daniel last week, sitting in his campus office inside Founders Hall. Daniel teaches public policy and criminal justice. He's lived in Arcata since the early 1970s, and he witnessed, back then, "a major change in Arcata politics." The city was divided over the proposed building of a six-lane freeway -- with the option of growing to eight lanes -- and the result was "a replacement of sort of the good ol' boys by the `hippy orangutans,' as one of the people who lost called them." The "hippy orangutans," who wrangled the freeway proposal down to four lanes (with the option of six later) included Dan Hauser (Arcata's recently retired city manager) and Wesley Chesbro (now a state senator). "And since that time," said Daniel, "the progressives have been in. They've been referred to as the Arcata Mafia. The majority of the council has been Green. And Arcata itself has changed -- it's a university town. Students have come to HSU and then stayed, like [current councilmember] Harmony Groves." Arcata certainly isn't like Eureka -- that politically rifted seaport circus riding dogs and ponies around development of the Balloon Track and the future of the waterfront. And while Arcata's council candidates are variously explaining how they'd tackle the city's basic issues, they also seem free to front their finest progressive fantasies. But first, we must dispatch with one of the candidates. Nick "Eeyore" Page, a circus manager with no listed party affiliation and a no-show in the latest rounds of politicking, has, we presume, got his hooves stuck in a honey jar and is somewhere sleeping the whole thing off. As for the rest, a fine Arcatan bunch: Bobby Harris (Democrat), Dave Meserve (Green; incumbent), Dana Quillman (Green; partner of current councilmember Paul Pitino), Jeffrey Schwartz (Green), Alex Stillman (Democrat), Mark Wheetley (Democrat; incumbent) and Michael Winkler (Democrat). They don't agree on everything -- Harris pushes for rent control, for instance; Meserve likes the idea, but the others don't. Quillman supports Measure W, which would stop the city's fluoridating of its water supply; the others do not, although Meserve had toyed with the idea. Otherwise, they're all for affordable housing. They support working more closely with HSU to share resources and expertise to spur economic and social growth. They all want to help entrepreneurs. They all wish for more alternative energy usage. They'd like to fix the plaza troubles, one way or another (although Schwartz is less inclined than the others to think more police presence is the answer). And all agree that the current council, while wonderful in many ways, suffers from indecision and lacks leadership. But even so, one can shuttle a couple candidates toward just left of center and sprinkle the others along a line that heaves farther left. And if not a major shift in the political wind, citizens might be given to expect a subtly altered course and slight lessening of the breeze, depending on who's elected. Stillman, a historic preservation consultant, moved to Arcata in 1971 to attend HSU. She was on city council from 1972 to 1980 and was mayor from 1974 to 1978, and owns a number of buildings in downtown Arcata. In a chamber of commerce questionnaire sent to all candidates, Stillman said her No. 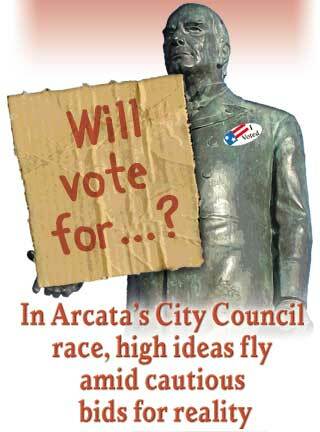 1 priority "would be to get the Council focused so it can effectively address Arcata's issues. We need to get things moving." She would be a consensus builder, grounded in practicality. For some, Stillman is a reminder of a productive past. She was on the council when the freeway was scaled back, the first bus transit system was started, sustainable forestry was begun in the Arcata Community Forest, and the Arcata Marsh was conceived and built. Wheetley has been an Arcata resident since 1977, a City Council member since 2005, and is a senior biologist with the California Department of Fish and Game. He's been on the California Coastal Commission and worked for the California Coastal Conservancy. He talks about funding and supporting open space in Arcata's north bay, involving youth in city business and working with HSU. "They're a great neighbor and an asset to Arcata, but HSU makes very large impacts on Arcata's housing, traffic, city services and other needs," he said in the chamber's questionnaire. But what Wheetley really represents is hard, thankless, agency-savvy work. He's not flashy. Perhaps he undersells himself. Newcomers might not realize he was one of the key players in creation of the renowned Arcata Marsh and wildlife sanctuary/water treatment facility. He helped restore Manila Dunes, clean up the South Spit, build the Hammond Trail and promote watershed restoration projects along the north coast. He helped develop the county homeless services center. Michael Winkler, an energy research engineer, has been on the city planning commission since 2000, has worked at the Schatz Energy Research Center since 1997, and has served on the Humboldt State University Campus Center for Appropriate Technology steering committee since 2000. His endorsers include engineering, philosophy and economics professors, Arcata Director of Public Works Doby Class, Schatz Center Director Peter Lehman and Russell Forsburg (chair of the Arcata Forestry Committee). Winkler's heart lies in alternative energy -- he has a long-term notion of turning Arcata into a net energy producer, of forming "an energy system that would be the envy of the country." But he also wants to tackle infrastructure needs and the problems with panhandlers on the plaza. "Our streets are filled with potholes, our sewers are leaking, our plaza's unsafe," he said during the debate. He promotes "tough love" toward the homeless and very little love for the passing-through moochers. Also, Winkler has no fondness for symbolic resolutions dealing with non-city business. Incumbent Dave Meserve has been in Arcata for 37 years, and is a self-employed designer/builder. His top priorities remain intertwined, local-global: "Community energy and food independence," reads his website. "Social, economic and political justice; public comfort and safety." He's endorsed by the Local Solutions Political Action Committee, the Humboldt Green Party and numerous community members. Meserve joined the council in 2002. And it's been his propensity for symbolic resolutions concerning national and global affairs that has helped launch Arcata's liberal personality into the national consciousness. In 2003, he sponsored an ordinance, which passed, that makes it unlawful for city staff to comply with the USA Patriot Act. Dozens of cities and counties across the country followed suit. In 2004, the council passed a Meserve resolution howling for President Bush's impeachment. He represents much that is near and dear to the war-hating, social-justice-loving Arcatan mind. To others, he represents that point on the city's progressive arc at which everything could fly dangerously off into a tangent headed for wackoville. But Meserve has pushed for local change, too: public bathrooms near the plaza, a police foot patrol on the plaza (which is happening). "We have the capacity to focus on the local as we keep our eyes open to the world," Meserve said in the debate. Dana Quillman is a self-employed massage therapist, astrologer and exercise instructor. She's lived in Arcata since 1985 and says the hardships she's faced making a go of it here have been a blessing, of sorts, and solid groundwork for her serving on the council. Her website may start with a "Hi!" in purple letters, positioned like a flower beside a hovering hummingbird, but her ideas tackle the basics: expanding the police foot patrol on the plaza, installing bathrooms (perhaps pay ones, with tokens offered to the poor), having a night shelter for homeless people and supporting self-employed business owners. "I want to represent the masses," she said during the KEET debate. "I live in a lower income bracket, I have no health insurance and I have no savings account." She has no problem with the city's passing symbolic resolutions -- one reason she moved to Arcata was its political activism. She is in favor of Measure W, which would end the city's water fluoridation program. And she is not accepting endorsements: The vote of the people on election day is endorsement enough for her, she says. Bobby Harris is a legislative advocate and a medical marijuana farmer -- and, lately, "a philosopher posing as a politician," as he put it in the debate. His campaign is low-key, he doesn't list endorsements. "In socio-economic terms, for me to win this election would be like a donkey winning the Kentucky Derby," he said in the chamber questionnaire. "Of course, though, if citizens really want to get the crucial, working-class job done, through a difficult terrain and climate, and really want the key political supplies advanced against all challenges and obstacles -- instead of risking key public interest performance on a showboat, elite racehorse, they may want to seriously consider voting for this donkey (who is trying to discover the deer path to the hilltop, since he can't travel on the establishment track)." Resolving the housing crisis is Harris' top priority -- it would reduce homelessness, he says. Rent control is his platform. If elected, Harris said he would propose establishment of a citizen advisory committee on housing, and attempt reform of the 1995 state Costa-Hawkins Rental Housing Act,which hampers local jurisdictions when it comes to rent control. Harris thinks city government needs to open up, to let some fresh air in. And the university ought to be sponsoring debates every couple of years. 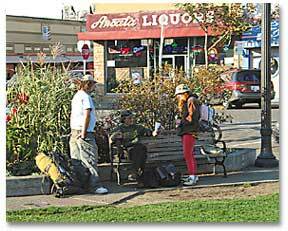 As for the homeless, he said the city of Arcata "got in over its head" with the Arcata Endeavor. "We need to put a place between Arcata and Eureka" for the homeless, he said, and let it be a regional solution. Jeffrey Schwartz is a deputy district attorney in the Humboldt DA's office. His website lists one endorsement: his sister-in-law Debra Burstiner, a member of the Arcata Open Space Committee. Schwartz's fondest idea is something he calls a "Round Up For Arcata Beautification and Infrastructure Fund," in which consumers could choose, while shopping at various Arcata businesses, to round up the price of their purchases to the nearest dollar. The change could finance, perhaps, his other ideas: a "one-stop integrated service center" for homeless plaza folks, mixed curbside recycling, a zero-emission city shuttle service, and "affordable car-free housing close to the plaza" (starting with the vacant paved lots west of K Street). 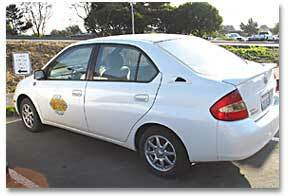 He also proposes a zero-emission car share program, similar to the Arcata Bike Library, with cars "donated by large experimental car companies," as he said during the debate. "We can become a boomtown of socially responsible businesses." Schwartz likes the symbolic resolutions the council's become famous for. "Sitting around in Big Blue [Cafe] and talking about it is not enough," he said. "If a city council resolution is what it takes to stop this madness ... I'm all for it." 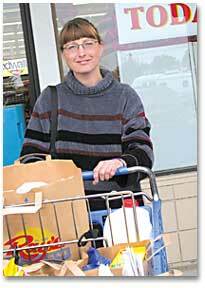 Last Friday in Valley West -- a much-taxed commercial sector some say needs more resources, like police -- Julie Sassi stood outside Ray's Food Place with a cartful of groceries waiting for her husband to pick her up. They live in an RV in Manila and are on the Section 8 housing waiting list. Her husband's on disability for a heart condition, and she works in the Valley West Carl's Jr., making minimum wage. One might think they're a little sour on the city. But not Sassi. "We relocated from Oregon, and people here have been really nice," she said. "It's a nice community, because the people like to help each other." Right: Julie Sassi. Photo by Heidi Walters. She watched the city council candidate debates on KEET-TV last week. "I think the fellow with the red hair, Bobby Harris, was the best. And the other fellow, with the ponytail, I like him, too." Downtown, inside Everett's, one of the plaza bars, bartender Donna Hammers waited on a counterful of quiet, easygoing, early afternoon drinkers -- all men, some from a local tree service. Perhaps unfairly, just one issue was put to her for response: incumbent Meserve's proposal that the city impose a "tippler tax" on late-night drinking establishments, which could fund more police patrols. Most of the candidates are for it. "Whoever thought of that is an idiot!" said Hammers. "I'm all for the police, because they help us. But how can you raise just one type of business's tax? We can't tax that little boutique over there," she pointed toward the west, voice rising, "because we don't like the clothes they sell. You cannot tax these businesses -- flat out! It pisses me off!" Sitting at the large dining table inside the 1858 Nixon House he and his family have lived in for 35 years, former city manager Dan Hauser reflected last week on the council's future. He was on the council in the 1970s, left to serve in the legislature, and the past five years he was Arcata's city manager. He retired in May. "I think the council for the last three or four years has been adrift," Hauser said. "They have not had a working majority, and have been somewhat leaderless." Hauser and his wife, Donna, have endorsed Stillman and Wheetley. "In the '70s, there were a lot of strong personalities. And when Wesley [Chesbro] and I were elected, along with Alex, we formed a good working majority. And even though we disagreed frequently, we agreed on enough things and we moved forward." Left: One of Arcata's electric cars. Photo by Bob Doran. He said the same forward motion continued in the 1980s and 1990s. But then it faltered, about the time when councilmembers Bob Ornelas and Connie Stewart left the council. "A number of things brought about a polarization on the council ... and an inability to work together." The city suffered, he said. "One of the issues [now] is getting rid of the weirdo, wacko title that Arcata has." Another, he said, has been low morale among city employees, some of whom have been beset by irate citizens over decisions the council has made. Hauser said he also was often frustrated. For example, he wanted to restructure water rates and realign certain city departments to make them more efficient and eliminate duplication. "The council shot it down." Hauser predicts that if Stillman and Wheetley win the election, along with Harmony Groves they could form a new working majority. But if they don't win this election, he said, "the city will have more problems than less." Back up on the hill, Professor Daniel is calling the election. "If I were going to bet -- and I wouldn't bet much more than 35 cents on it -- I'd bet Mark Wheetley and Dave Meserve will win." But he predicts a close battle between Meserve and Stillman, with perhaps the student vote deciding it. "It's interesting, Alex was one of the originals of the Arcata Mafia. Now she's less progressive, more development oriented. She owns half the town. And I think it's going to be difficult for her. She's a very controversial figure, and there are old timers here who can't stand her." But Meserve's hesitant stance on fluoride -- first he was for keeping it out of the water supply, now he says he isn't -- "could work against him. Measure W's going to go down big time, as it should." For whoever gets elected, Daniel has some practical advice: "The real issue is the -- and pardon the language -- public pisser. The council, I think, voted against money for it. But it's symbolic of a lot of things Arcata could, and should, do. A lot of European villages do have public bathrooms. Sure, it was expensive, but it could have added to Arcata's image as a progressive town on the cutting edge of environmental protection."